Cake Pop Tips – amandarobots. I have recently discovered that I love making cake pops, which is super cool because everyone in my household loves to eat them. These little suckers (see what I did there?) are all the rage these days, and retail for around $2 each. Some say they’re the new cupcakes, but cupcakes will always have a special place in my heart. I’ve made them twice so far, and the second time around went much better than the first because I kept a number of things in mind. I considered posting about my recipe and then realized that a) I don’t really have one, and b) the web is already saturated with cake pop recipes. So instead, here are my top tips to make some amazeballs (see what I did there?!) 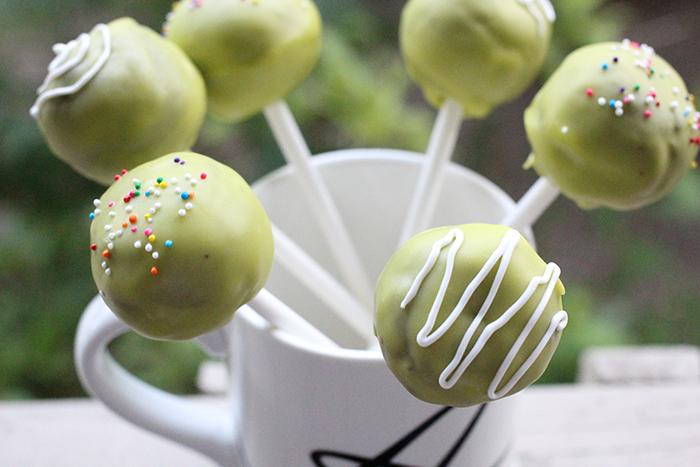 cake pops. Don’t work from a recipe. Seriously. 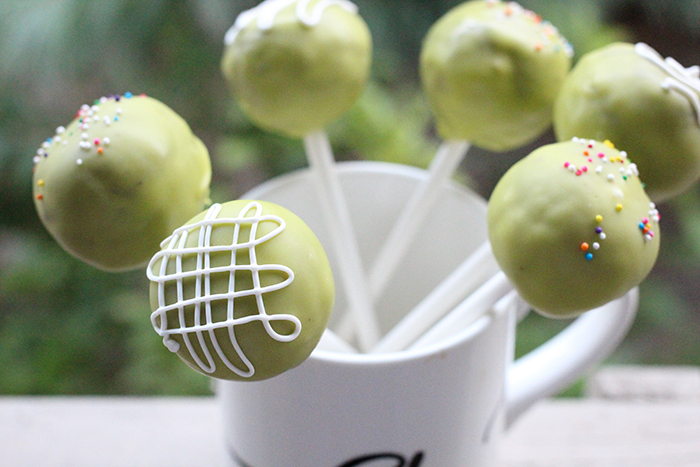 Everybody’s cake and icing is different, and you can make a cake pop with just about anything. I’ve done vanilla cake with vanilla buttercream, and chocolate cake with chocolate buttercream, but the possibilities are endless. Use your favourite recipe, but keep in mind that moisture content and density will vary from cake to cake. Vary your icing accordingly. For example, I put about two cups of icing into my vanilla cake crumbs because that cake was a little drier; my chocolate cake crumbs were super moist and gooey, and thus required about half a cup of icing. Adapt! Don’t roll your cake balls too big – if you roll them to the size you want the cake pops to end up being, they’ll be gigantic once covered in candy. Roll them slightly too small, knowing that dipping them will bulk them up. Let your cake balls set in the freezer before inserting the stick, but don’t let them freeze. If they freeze, they might crack your candy coating when you dip them. Use candy melts for your candy shell because they’re made for melting and re-hardening. I get mine at Michael’s, but they sell them at Walmart and Bulk Barn too. Melt your candy melts in a double boiler. Do not microwave – it doesn’t provide the constant heat required to keep your candy liquid-y enough for dipping, and you might burn the candy anyway. (I know I did.) If you don’t have a double boiler, fill a pot with water and put a heat-safe mug in it. Put your candy melts in the mug. Bam, double boiler. Don’t try to dip in straight melted candy or chocolate – add veggie shortening. This thins and smooths it out considerably but doesn’t affect the way it sets. If you try to dip your cake pops into straight melted candy, it will either a) get stuck and fall off the stick, or b) start to break apart. 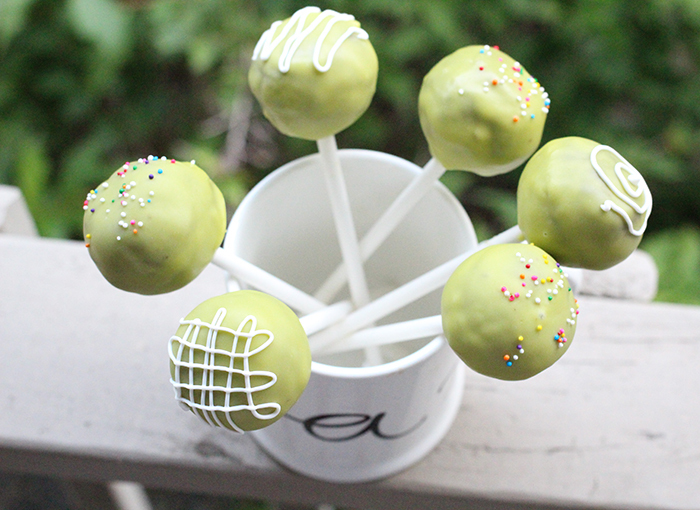 If you want to make right-side-up cake pops (like the ones above, not like these ones), you need a cake pop stand. But forget the expensive store-bought ones; I bought a piece of styrofoam from Michael’s for $5 that works just fine. Green florist’s foam works too! The decorating possibilities are endless – have fun! I like sprinkles and drizzled candy melt the best, as you can see. There are even people on Instagram who make elaborately decorated cake pops!